As cruise director in charge, enjoy a truly awesome around the world cruise of a lifetime aboard the super luxurious, Liberty of the Waves! Arrange fabulous excursions in the Caribbean, Europe, Asia and more. Visit famous tourist sights and landmarks. Help passengers with cabins, shopping, dining, leisure aboard ship and at ports of call along the way. Collect souvenirs, look for hundreds of hidden objects, items lost by passengers and trash for recycling. 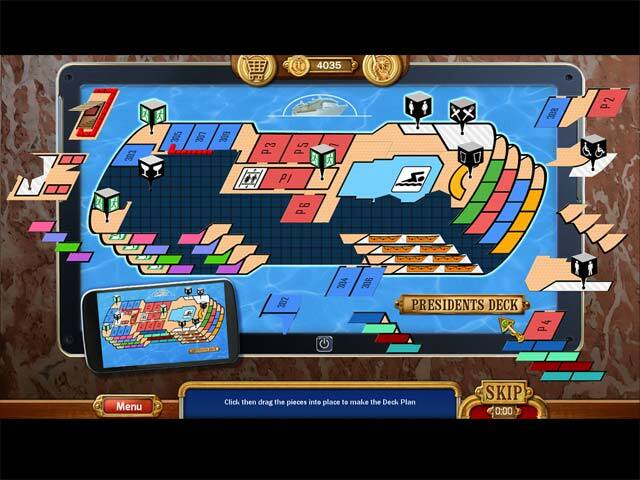 Vacation Adventures: Cruise Director 2 guarantees truly captivating, hour upon hour gameplay for families and all ages to enjoy. 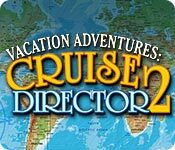 Vacation Adventures: Cruise Director 2 is rated 4.3 out of 5 by 32. Rated 5 out of 5 by Bumbles2 from Enjoyable game and relaxing too !!! We really enjoyed this game...not too stressful and not too easy...a game you can play and relax at the same time. We highly recommend this game !!! Try it...play the demo...and I think you'll be pleasantly surprised too!!! Rated 5 out of 5 by SparkleGlow100 from HOPS GALORE! - Travel the world - Top-notch graphics -Fills widescreen PURE HOPS game. What a fantastic find. Can’t wait for the next in the series. The scenes are chock-a-block with well-hidden items. The scenes are like panoramic snaps of moments on your cruise, and of the many stops you make all over the continents. I especially loved all the outdoor scenes, the ones on deck and the many land-stops. Extra fun includes special items that earn you extra points! Easy puzzles, like jigsaws and flip the squares around to form a picture are also present. What I loved also, was that although the scenes are static, there is usually some movement that makes you feel like you are really standing there watching the scene - always something, like a distant, slow-moving jet-skis, or a plane. The quality of the graphics matches the current games of 2015-2016. There are NO voice-overs. The characters appear in front of you, head and shoulders, and then you read. Rated 5 out of 5 by Kimmycoo from Worth Every Cent! I love these games! I wish there were tons of games like this, where you could travel all over the world or even to a certain country on each game and tour the country or the world in this way, through gaming. This game here was fantastic. You really got a good look at several countries all around the globe. I was so surprised at how long the game is too. Usually these are short but this one rocked! I know I played for hours and hours. Gorgeous scenery, the people, the food, the items. I love collecting the rubbish in each scene and the special items too. The mini games are always fun and you actually learn a lot along the way too. Please developers give us more of these. I love the Vacation Adventures and the holiday themed ones as well. I hope you guys would think to perhaps make more games where we would tour a specific country. Like a vacation adventure or cruise all about Sweden only or Russia, Paris, the Arctic, the USA, South America, Africa, England, Ireland just any of them. A whole series of games like that. VERY WELL DONE, 5 stars! Rated 5 out of 5 by ThePearlDragon from A Great Family Game A fun family game to play on a Sunday afternoon. Rated 5 out of 5 by Linda_in_Aussie from Classy HO Game I love this game. Very relaxing, bright and cheerful with a cute story line that flows. Background music is easy to listen to and although somewhat repetitive, it's by no means annoying. Loving the piano playing. No real challenge with the mini-puzzles but playable. I like it that the hidden objects are placed strategically where it "makes sense", like you wouldn't find a security camera tucked on the floor in a shoe or a coffee pot in a tree, etc. But they're still challenging to locate. My only neg is that, although I have played this a few times over, I've had to skip the last jigsaw puzzle. Once was enough. I do own and play a number of Vacation Adventures... bring on more please!! Rated 5 out of 5 by Magnumgirl51 from Great Game I really love the games from this designer. They are simple, relaxing HOGs; no inventory and not much thinking. I do not purchase most of the HOGS simple because they are so dark and the inventory is frustrating, at least for me. I like to just sit and play the more casual games and this game designer does not disappoint. My grandsons also love playing these so these games are often played. Plus, all of the scenes are beautiful and bright, and the music is pleasant. Rated 5 out of 5 by Reneenct from Love this game I played the first one and purchased the second one without even trying it. This is very unchallenging, fun and relaxing, like the first one. Basically the second one is a similar game (many of the same scenes, same main characters) with a change to the map feature. When I came to the end I started feeling a little sad, lol, my cruise was ending! As others have said, there is no creepy, dark or supernatural anything in here, no one is murdered either, which is a nice change. Don't know why I like these but if you like old style HOGs with almost no story line and relaxing (elevator) music then these are for you. Rated 5 out of 5 by Blackie110 from A Pure Hidden Object Gem I bought this without playing the trial. 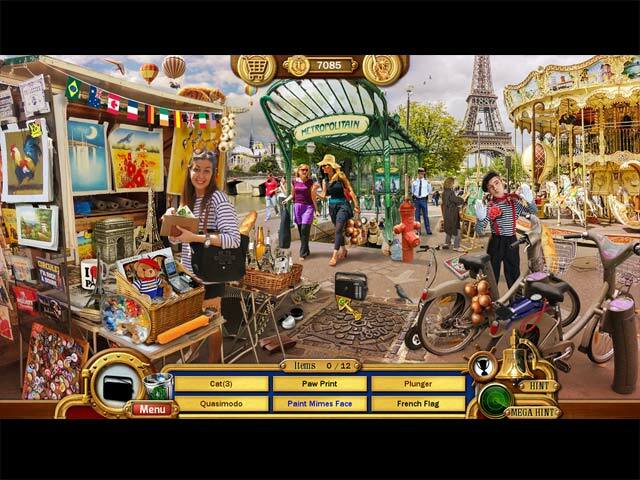 A very relaxing game for all you hidden object junkies out there. Rated 5 out of 5 by debnaomi from Old Fashion HOG I love, love, love this type of HOG. A true HOG with many puzzles between scenes. I buy all of this type of game without even doing the trials! Keep bringing these games Big Fish...we are excited when you do. The ultimate 5-star, around the world cruise from New York to San Francisco on the super luxurious flagship, Liberty of The Waves.